Pollen preserved in spring deposits in the Yécora area is providing the first reconstructions past forests for the Sierra Madre Occidental. Cristina Peñalba and Carmen Ortega took cores from of the organic mud trapped under the peatmoss in the Ciénega de Camilo and extracted pollen from the sediments. A radiocarbon date of 980 yr B.P. [radiocarbon years before 1950] was obtained at 40-60 cm depth and 8610 yr B.P. at 3.6 m depth. Carmen analyzed the fossil pollen for her undergraduate thesis at Centro de Estudios Superiores del Estado de Sonora (CESUES) in Hermosillo (Ortega 2000, Ortega et al. in press) and for her masters thesis at UNAM in Mexico City (Ortega R. 2003). She found that the Ciénega de Camilo has supported a pine-oak forest for at least the last 8600 years in the middle and late Holocene. 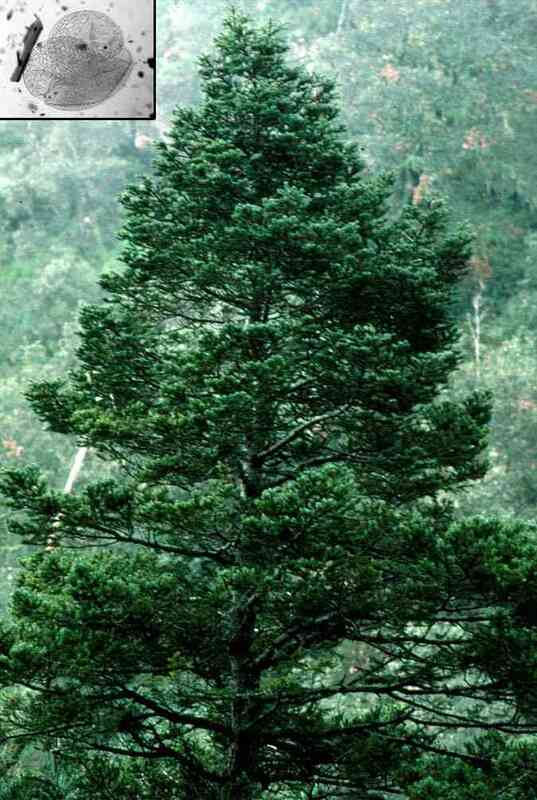 From 8600 to 6000 years ago, there was a mixed-conifer forest in the area dominated by pines with fir (Abies) present and oaks less common than today. The modern analog for this Camilo paleoforest is in the deep canyon on the southwest and west edges of the Mesa del Campanero where there are isolated stands of southwestern white pine (Pinus strobiformis) and Durango fir (Abies durangensis). The forest at Camilo has been relatively modern without fir and more oaks for the last 4000 years. 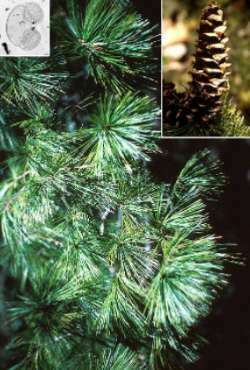 Declines in fern spores, increases in oak and juniper-cypress pollen suggest that the vegetation became progressively more open in the last 600 years, in part reflecting human activities in the area. The Mountain Pima village of El Kípor (spelled Quipur on some maps) is located at 1680 m elevation in a scenic grassy valley surrounded by pine-oak forest about seven kilometers east of Maycoba. Cristina Peñalba and her student Antonia López H. took a meter-long sediment core from the El Caballito Blanco spring in the bottom of a small arroyo below the Pima houses. Organic material from the top of the core was radiocarbon dated at 34,000 yr B.P. Antonia analyzed the physical properties of the sediments and the fossil pollen in this core for her undergraduate thesis at the Universidad de Sonora in Hermosillo (UNISON; López H. 2003). 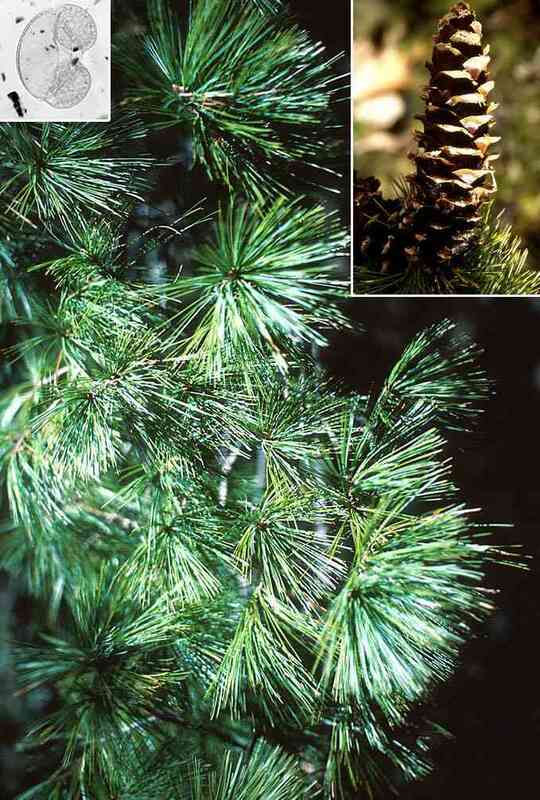 The pollen reflected a more mesic pine forest with spruce than the pine-oak forest of today. Her study is the first terrestrial paleovegetation record for the middle Wisconsin glacial period from Sonora and the Sierra Madre Occidental. With three meters of sediments above the core, the Caballito Blanco site can potentially yield a record of the El Kípor forest for the last 40,000 years. Antonia will analyze the upper sediments for her masters thesis at UNISON beginning this year. Pollen analyses are dependent on modern reference samples to identify the grains using a variety of morphological characters. Cristina Peñalba at UNAM and Lizeth Larios R. at UNISON have compiled a very extensive reference collection of the pollen of Sonora to help in various pollen studies ranging from the fossil deposits in the Sierra Madre to the flowers visited by bees in commercial apiaries. Van Devender and Reina have contributed pollen samples from 846 species of plants from Sonora, Baja California, and the southwestern United States. Reference samples are mounted on microscope slides for use in identification. Pollen used to identify fossil pollen is chemically treated and mounted in glycerin jelly on the slides. 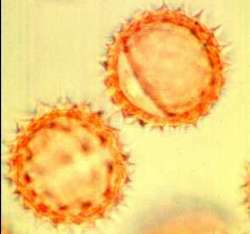 Reference slides used to identify modern pollen in pollination studies, honey production, etc. are simply dried and mounted on the slide. Additional pollen is preserved in vials and is available to other pollen researchers. Lizeth began working with the pollen collection as part of the Museum’s Migratory Pollinator Project maintains the collection. Cristina and Alberto Búrquez have a photographic atlas of the pollen grains of 112 species of plants in the Plains of Sonora desertscrub near Hermosillo accepted for publication. Carmen used the reference collection to compare the modern pollen ‘rain’ and vegetation along a transect from the Río Yaqui near Tónichi to near Maycoba in the Sierra Madre (Ortega 2003). Lizeth used the collection to study the plants being visited by honey bees in commercial honey production near Hermosillo. López H., A. 2003. Paleoambientes del Pleistoceno tardio (ca. 34,000 años BP) a partir de un nucleo de sedimento de la cuenca El Aguaje del Caballito Blanco, NW de la Sierra Madre Occidental, Maycoba, Sonora, Mexico. Tesis de Licenciatura, Departamento de Geologia, Universidad de Sonora, 86 pages. Ortega R., C. I. 2000. Historia de la vegetación en la Ciénega de Camilo durante el Holoceno, Municipio de Yécora, Sonora, Sierra Madre Occidental. Undergraduate Thesis, Centro de Estudios Superiores del Estado de Sonora, Hermosillo, Sonora, Mexico. Ortega R., C. I. 2003. Palinologia de la Cienega de Camilo: datos para la historia de la vegetacion y el clima del Holoceno medio y superior en el NW de la Sierra Madre Occidental, Sonora, México. Tesis de Maestria en Ciencias Biologicas (Biologia Ambiental), Universidad Nacional Autonoma de Mexico, 109 pages. Ortega R., C. I., M. C. Peñalba, J. A. López S., and T. R. Van Devender. In press. Premiér étude paléoécologique dans la Sierra Madre Occidental (NW du Mexique): pollen et palynomorphes non polliniques d’une séquences Holocéne. Comptes-Rendus de l’Académie des Sciences, Paris, France. Peñalba G., M. C., and A. Búrquez M. In press. Flora polinica de Sonora, México. Ia. Planicies de Sonora (Desierto Sonorense), southern Hermosillo. Boletín de la Sociedad Botanica de México.